These vegan patties were inspired by our friend and neighbor, Brian, who claims that celery root burgers are a popular food item in his home country of Denmark. Brian sent us his notes for making patties, which we have adapted into this recipe. We highly recommend using a food processor with a grater disk to prep the potatoes, carrot, and celery root. In a large bowl, combine the grated potatoes, celery root, carrot, egg replacer, and nutritional yeast. Add the salt and black pepper. Liberally coat a large baking sheet with cooking spray. Using clean hands, form palm-sized patties of the mixture, about 1/2-inch thick. Squeeze slightly to remove excess water from each patty. Place formed patties on the baking sheet, then give the top of each a light coating of cooking spray. This recipe makes about 6-8 patties. Bake at 350 degrees Fahrenheit for 20 minutes. With a thin spatula, carefully flip each patty, then bake for an additional 20 minutes. 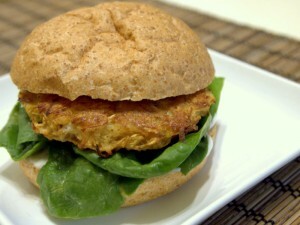 Enjoy as a veggie burger or by themselves!